So, I suppose this DC page looks a little out of place in the rest of this collection. The Atom, a bunch of robots, and someone named Willow that you've likely never heard of before. The art collection here at this site seems to be MTIO, the Serpent Society, Mantis, and a few other oddities, right? So what's this page? Well... in the mid-1970s, Steve Englehart married Mantis off, sent her into space, and then within a few years left Marvel himself. However, Mr. Englehart took something with him, when, in Eclipse's Scorpio Rose, a mysterious green-skinned antannae-bearing woman named Lorelei settled in Connecticut to raise her newborn young sun. Yes, Mantis, albeit disguised, had crossed companies. However, even before that, in DC's Justice League, a mysterious green-skinned woman with two buds on her hair sought a place to raise her as-of-yet unborn child. 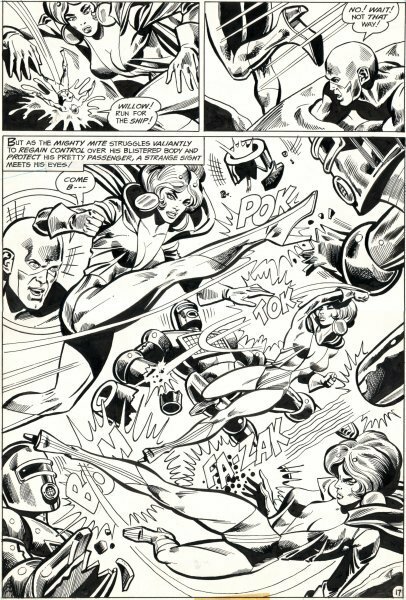 Yes, in this page of art, "this one" is Mantis, disguised under another name, Willow. You can see why the geek in me loves this storyline, and I'm happy to have this page from it. This one came off of eBay, in very early July of 2010. Excellent seller all around.